I’m sure I can’t be the only one who has ever been excited to try out a new product only to find that it doesn’t do much for my hair. It’s not particularly bad, it’s just not particularly good either. Currently I have two such products in my collection. The first is Palmer’s Coconut Oil Repairing Conditioner. I was looking forward to use this product for the first time as it does not contain any sulphates or parabens, you know, all the bad stuff. Unfortunately I found that it didn’t provide much moisture or any slip for effective detangling. The second product is Aussie Mega Instant Conditioner. After having heard this product raved about so much, I was extremely disappointed when it didn’t do anything for me. My hair didn’t really feel moisturised after I left it in for a few minutes and again it didn’t provide any slip for detangling. What an anti-climax. So instead of throwing these conditioners away (because that would be wasteful), I have come up with a few ways that I can still get some use out of them. Since a pre-poo treatment gets washed out anyway, you can easily mix up some of the ‘dud’ conditioner with a dash of oil and a bit of water, and use this mixture as a pre-poo treatment. Not only will you have found a use for the product, but you won’t have to use your more effective, and often pricier, conditioners for the pre-poo. As I wash my hair in 4 sections, I sometimes add a bit of the ‘dud’ conditioner to the just-shampooed section before I move on to wash the next section. This ensures that my hair isn’t left with the often dryish effect that shampoo can have, for any period of time. Once I’ve shampooed and conditioned each section, I’ll rinse out all the ‘dud’ conditioner after which I proceed to apply my deep conditioner. You’ll be amazed at how quickly you can turn your ‘dud’ conditioner purchase into a happy mistake, simply by adding some of your favourite oils, honey and aloe vera juice. To turn up the slip factor, add a lot of extra oil to ensure a veritable spa session for your strands. Has this ever happened to you? 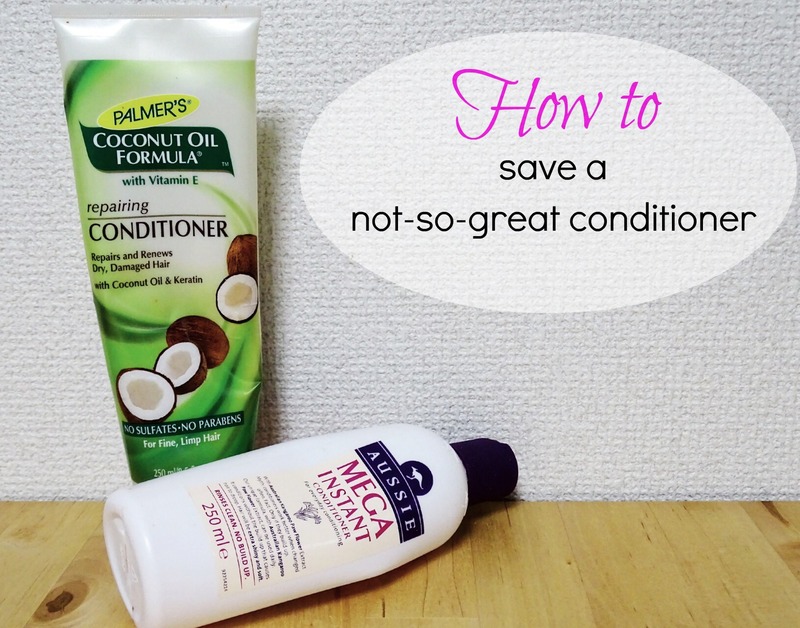 Comment below and let me know what you do with your not-so-great conditioners. Thanks for stopping by and reading Amy! Love love love your suggestions! While I normally agree with the mentality that if a product doesn’t do anything for your hair its best to rid yourself of it than torture your hair with it….I can agree on all points as it pertains to conditioner. The Shea Moisture Conditioner did absolutely nothing for my hair during the wash process so I ended up using it as a leave-in and base for a deep conditioner. Brilliant post as always, Eleanor!! You’re a star! Yes yes yes!!! I’ve been known to have 6 or 7 conditioners sometimes and this is what I do to make sure that they’re all used. Sometimes i’ll use a slippery non-moisturising conditioner for my first finger detangle, or i’ll put a moisturising one thats not slippery in a conditioning treatment, either way we pay good money (sometimes too much) for our conditioners, so it’s always nice to get our moneys worth.